exida's FMEDAx finds design problems and predicts failure rates and modes. This technique meets requirements for certification to safety standards like ISO 26262 and IEC 61508. 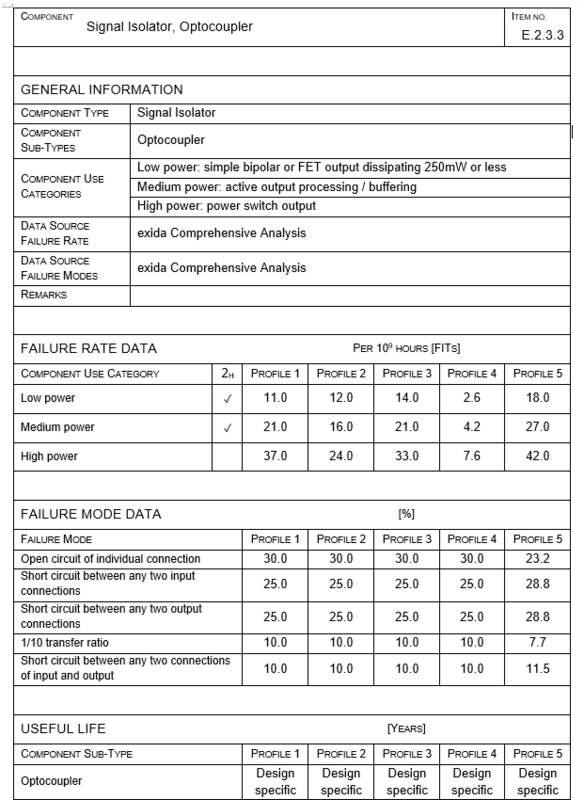 Failure Modes Effects and Diagnostics Analysis (FMEDA) is a failure rate/failure mode prediction technique invented by engineers at exida. FMEDA uses component failure rates chosen per a given design strength profile in combination with an operational profile which specifies an application and environment. the environment in which the device will be deployed. The FMEDAx Tool user enters this information for the specific design based on product schematics and mechanical design documents along with knowledge on the potential impact of expected failure modes and how they would be handled in the specific system under evaluation. This analysis is a part of the typical high-quality product design certification process for a product certified to IEC 61508 for a particular Safety Integrity Level (SIL). The FMEDAx tool was created by the inventors of the FMEDA technique and incorporates the knowledge developed over decades of use. The FMEDAx tool comes with one or more specified component databases that cover all needed components and the proper operational profile. 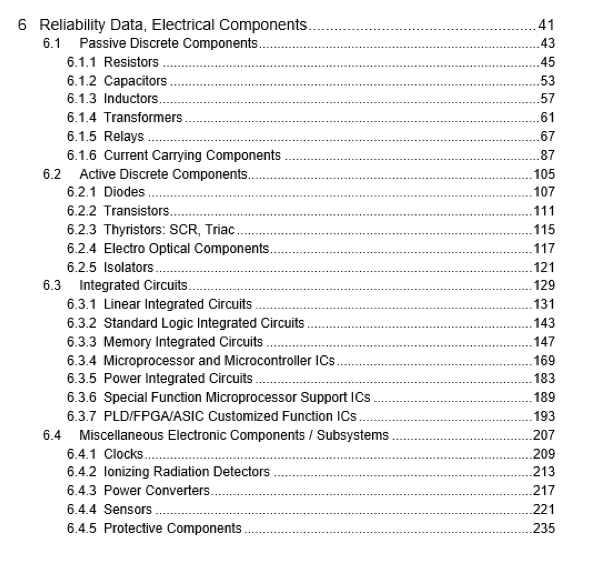 exida has developed three general purpose component failure databases: electrical, mechanical, and sensors. 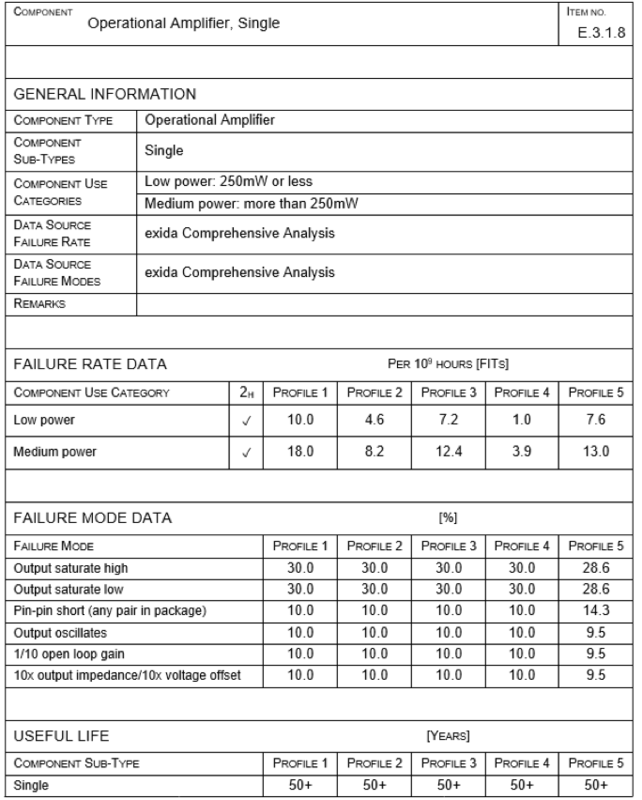 Provides all the information needed for accurate failure rate/mode predictions. Unlike other database sources, the EMSCD™ database contains failure rates, failure modes and failure mode distributions for a variety of operational profiles and applications. Engineers performing FMEDA work will no longer have to spend hours searching the internet for failure modes / distributions then wonder about the pedigree of the data. Has a stronger variety and quantity of electronic and mechanical components than any other component database. Combine this with the EMSCD™ database service, where licensed customers may request new part creation based on exida data. This will save many engineering hours. Has been compiled based on over 350 billion-unit operating hours of traceable field failure data from owner/operators of industrial plants, manufacturer’s warranty systems, and published industry collections making it the global gold standard. Thus, the EMSCD™ meets failure data quality and traceability requirements of IEC 61511:2016 and other functional safety standards (IEC 61508, ISO 13849 and IEC 62061) helping to ensure the integrity of the FMEDA results. Provides failure rate / failure mode data sets for multiple application conditions and operating profiles. Is updated one or more times per year with new components and/or new failure modes/Failure mode distributions. This feature allows Engineers to stay up to date with the latest technology.